Truly viral brand buzz phrases aren’t easy to come by, and Bud Light is enthusiastically exploiting its own two-word phenomenon while it’s still hot. 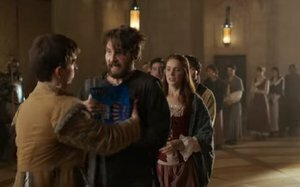 The latest Bud Light TV spot again extends its “Game of Thrones”-spoofing creative — and again features the “Dilly Dilly” phrase that’s taken off on social — this time to promote its “Super Bowl Tickets for Life” Sweepstakes. The “Handouts” TV ad (below), which debuted yesterday during Fox’s NFL football broadcast and NBC’s “Sunday Night Football,” will continue to air on NFL and other sports programming through Jan. 22, when the sweeps entry period ends, according to a brand rep. In this second year of the sweepstakes, fans can enter for chances to win four tickets to each Super Bowl for up to 30 years, starting with 2018’s game, by buying specially marked packs of Bud Light and submitting the provided codes by text message, online or in person. The “Dilly Dilly” phrase was first used by Bud Light in August, in a “Banquet” ad under the brand’s “Famous Among Friends” marketing platform. To date, that spot has been viewed more than 1.64 million times on Bud Light’s YouTube page. The brand has used the catch phrase in other creative several times since. A 15-second digital ad (actually named “Dilly, Dilly”), released in Oct. 12 — currently showing 2.2 million views on YouTube — consists almost entirely of the medieval court characters using the phrase repeatedly in toasts. A “Pit of Misery” spot launched on Nov. 22, also incorporating the phrase, has so far garnered 260,000-plus YouTube views. On the same day, Pittsburgh Steelers quarterback Ben Roethlisberger gave “Dilly Dilly” the kind of free publicity brands pray for, when he spontaneously shouted it out during a game against the Tennessee Titans. Instead of unleashing lawyers to protect its phrase, Bud Light posted a video on its Facebook page showing a town crier dressed in medieval garb objecting to Modist’s beer name, reading off of a parchment scroll. Bud Light even offered Modist two “thrones” at the Super Bowl. The tongue-in-cheek rebuke paid off in positive response from beer fans, another flood of video views — and a promise from Modist to rename the IPA “Coat Tails” as of its next batch. However, the analysis does not note the possible impacts of the Oct. 12-released "Dilly Dilly" digital ad noted above. Also, YouGov allows that “even if the ‘Dilly Dilly’ part of the campaign seems to be more hype than reality, Bud Light Ad Awareness benefited from all of their executions this fall.” The awareness score rose from 22% of all U.S. men in August to a peak of 28% by mid-November. That matched the brand’s second-highest Ad Awareness level of the year, just short of its post-Super Bowl mark, according to the research firm.